There are nearly 30 different waterfowl species that are commonly seen in New York State. 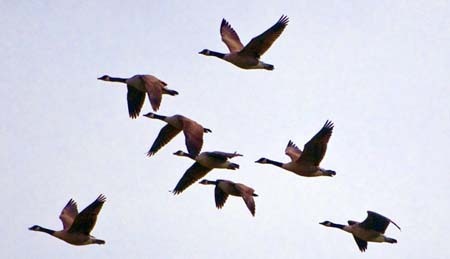 Waterfowl identification is important to birders and hunters. This page is all about identifying New York waterfowl. Puddle ducks, diving ducks, sea ducks, mergansers, geese and swans. See photos and learn details about their habitats, feeding, nesting, migrations and even flight patterns. These migratory birds have broad, flattened bills making it easier to feed on aquatic plants and animals. They have webbed feet, making them excellent swimmers. Their feathers are waterproof with a thick layer of down to keep them warm when it's cold. A picture may be worth a thousand words, but nothing helps with identifying waterfowl like seeing them in their natural environment. Knowing more about their habits and schedules will make it easier to find and identify them. Typically found in marshes and small rivers. Although good divers,they usually feed by dabbling or tipping rather than completely submerging under water. Irridescent and brightly colored wing patches (speculums), are generally a telltale identifying mark of the puddle duck. Usually found on larger bodies of water like lakes or bays and feed by submerging beneath the water, often to considerable depths. They feed on fish, shellfish, mollusks, and aquatic plants. Wing patches (speculums) are dull, usually white or gray. their wings are smaller in proportion to their body size than puddle ducks, giving them a more rapid wingbeat. Be sure to visit this page often as we add more and more pages of the different species. Just click on the links below to visit the pages.